Cook corn as directed on package until crisp-tender. Drain. In medium bowl, combine corn and all remaining relish ingredients; mix well. Let stand while preparing pork. Heat grill. When ready to grill, brush pork steaks with Worcestershire sauce; sprinkle with seasoned salt, black pepper and garlic powder. Place pork on gas grill over medium heat or on charcoal grill 4 to 6 inches from medium coals. Cook 10 to 15 minutes or until pork is no longer pink in center, turning once. 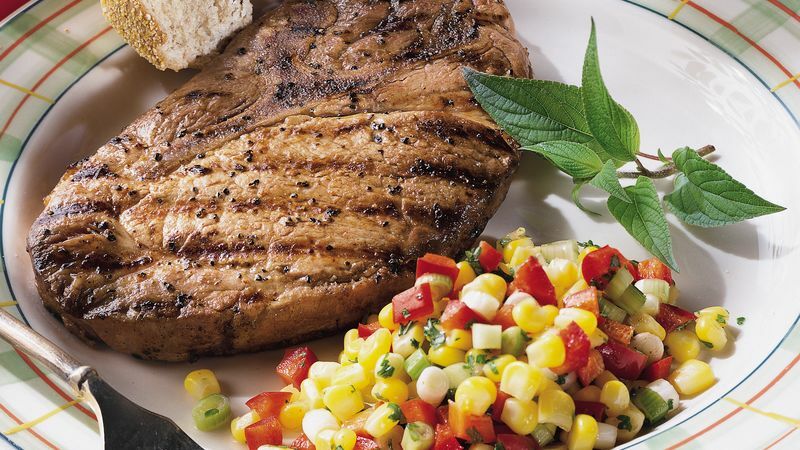 Serve pork steaks with relish. To broil pork steaks, place on broiler pan; broil 4 to 6 inches from heat using times above as a guide, turning once.